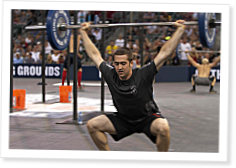 On Episode 156 of CrossFit Radio, host Justin Judkins interviewed 2010 Games qualifier Ben Smith and CrossFit success story Stephanie Vincent. This episode was webcast live at 6 p.m. PDT on Wednesday, Jan. 26, 2011. 5:10 Ben Smith is a junior at Old Dominion University and is looking for a return trip to the Games in order to compete for the title World’s Fittest Man. He came on the show to share his experiences from last year’s event and to talk about his road to the 2011 Games. Ben doesn’t work out at an affiliate, so he talked about training in his garage, backyard and various other places. He discussed his programming and the changes he’s making based on last year’s results. After talking about his diet, Ben spoke about the sport of CrossFit and how he’s seen it evolve. 34:35 CrossFit King of Prussia athlete Stephanie Vincent has lost over 100 lb. since starting CrossFit. Stephanie explained how she lost the weight and what her diet consists of now. She hit rock bottom after gaining weight after gastric-bypass surgery but says her mental and emotional states have transformed since starting CrossFit. Stephanie discussed how important the trainers and community from CKOP have been to her throughout the process. Thanks Justin for the opportunity to share my story with the Crossfit Community! If anyone wants to check out the post Justin read with pictures, you can find on the Crossfit King of Prussia blog at http://aimeesfitnessblog.blogspot.com/2011/01/100-pound-pr.html. You can also read more about my journey on my blog, www.radicalhateloss.com. Great interview Ben, I still cant get over the double bdwt OHS on your blog, awesome! Good luck this year! Great interviews. Amazing story, Stephanie! And for the record, I'm a huge fan of Ben Smith. Very inspirational stories, both Ben and Stephanie. Stephanie, you sound like a leader. Great achievements. Highly motivating. Keep it up!